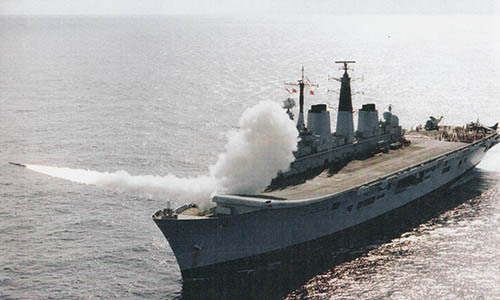 HMS Ark Royal fires a Sea Dart missile during Trial WOKING - September 1991. 10th January - Sail from Portsmouth to the Eastern Mediterranean as support for the Liberation of Kuwait. 22nd January - Ship arrives off Cyprus. February - In Eastern Mediterranean off Cyprus. 1st - 7th March - Visit to Naples, Italy. 15th - 20th March - Visit to Piraeus, Greece. 27th March - Arrive in Palma, Majorca. 3rd April - Sail from Palma. 10th April - Portsmouth for a Base Assisted Maintenance Period (BAMP) and Easter leave. 30th May - Sail from Portsmouth for Shakedown period. 6th - 18th June - Exercise OCEAN SAFARI. 20th -24th June - Visit to La Rochelle, France. 28th June - Portsmouth for Self Maintenence Period (SMP) and Summer Leave. Prepare ship to carry female personnel. July - Maintenance and leave period. 21st August - Sail from Portsmouth for Shakedown period. 24th - 26th August - Devonport Navy Days. 27th August - Sail from Devonport. 10th September - Sail from Portsmouth for WESTLANT 91 deployment. 21st - 28th September - Visit to Fort Lauderdale, Florida. To include "Ship Open to Visitors". 2nd - 6th October - Tactical development trials (Trial WOKING) at the AUTEC Ranges, Andros Island, Bahamas. 11th - 22nd October - Visit to Mayport, Florida. Includes station leave. 4th November - Visit to Gibraltar. 7th November - Filming of "Frankie's On...Board!" TV show starring Frankie Howerd in the hangar. 8th November - Sail from Gibraltar for aircraft trials. 19th November - Visit from Her Majesty Queen Elizabeth, The Queen Mother. 25th November - Embark first draft of 73 female Ship's Company members. 28th November - Commence Docked Assisted Maintenance Period (DAMP). To include the fitting of a reverse-osmosis plant. December - Maintenance and leave period.